When individuals need a reliable attorney who works to find long-lasting and positive solutions to their legal issues, they turn to attorney Cobb Young. With his more than 30 years of experience, you rest assured that an experienced and qualified lawyer is working on your case. Cobb has a well-earned reputation for winning criminal cases through hard work and persistence. He also ensures that your case is handled in a confidential and discreet manner. Regardless of your situation, he explores all your legal options to minimize any negative consequences. When our hard-working clients find themselves behind on mortgage payments or other debts, Cobb can provide you with a straightforward assessment of your financial situation. He applies his experience and thorough knowledge of the U.S. Bankruptcy code to smoothly navigate through bankruptcy proceedings. If bankruptcy is the right choice for you, he guides you through the process, and shows you how to reestablish credit quickly. If it is not, he advises you of other alternatives better suited for you. Contact a Missouri attorney in Joplin you can depend on. Call the Law Office of Cobb Young, LLC at 417-623-4000 or contact the firm online to schedule your free initial consultation. 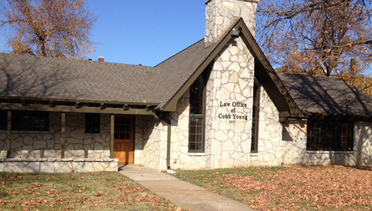 The Law Office of Cobb Young, LLC serves the people of all counties in the Missouri, as well as residents of southeast Kansas and northeast Oklahoma.